Unless you're a couture connoisseur, the word "wool" might conjure fluffy white sheep who graze in green pastures. Fashionistas with a flair for fabrics know that wool can come from many animals, and that some wools are more desirable than others. Wools range from soft and silky ones used for clothing to coarse and strong wools used for rugs. Wool fiber is measured in microns: The smaller the micron the finer and softer the wool. The most common wool animal is the sheep. Sheep can be categorized into three major types when it comes to wool production: fine wool, medium and coarse wool, and hair-type. Fine wool sheep produce the smallest micron of wool and include the Merino types, Rambouillet and Debouillet. This wool is commonly used in clothing production. Medium wool breeds include the Targhee, Suffolk and Cheviot. Coarse wool breeds are the Lincoln and Romney. The coarser wool is often used in making wool yarn used by hand-knitters. Mohair and cashmere come from goats. Mohair comes from the Angora goat, which produces a long shaggy coat that is generally clipped twice per year. According to the Department of Animal Science at Oklahoma State University, each shearing will yield approximately 5.3 pounds of wool. Mohair is known for its luster and is often used in clothing, shawls and fine yarn. Cashmere comes from the Cashmere goat and is considered one of the most luxurious of all types of wool. Cashmere goats are sheared yearly and can yield up to 2.5 pounds of fleece at a time. The Lama genus of animals, all of whom originate in South America, includes llamas, alpacas, vicunas and guanacos. 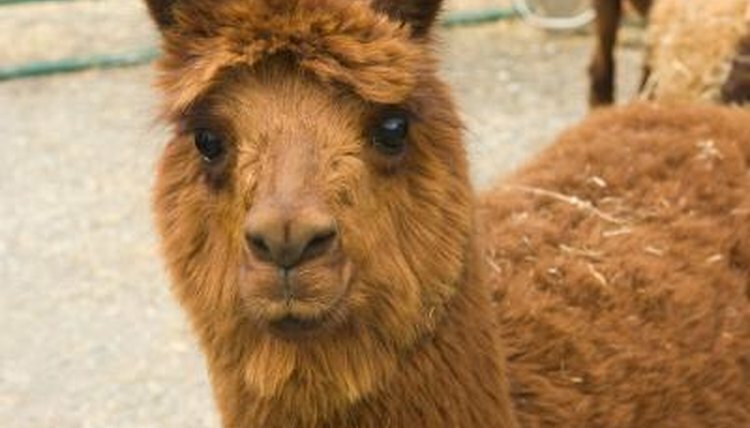 Of these, alpacas are the most common for fiber production. Llamas are generally clipped once a year and produce a coarse wool that includes stiff guard hairs. When the guard hairs are left in the wool is used for ropes and rugs, when removed the wool can be used for yarn. Alpacas are typically sheared every one to two years, producing about 6 pounds of wool each time. The finer alpaca wool does not contain guard hairs and is used to spin fine yarns. Camels, native to North Africa, the Middle Easy and Central Asia, are less well known for their wool. Camel hair is most commonly produced in Inner Mongolia and other areas in China. Camels are typically sheared once a year; a camel can produce about 20 pounds of wool each year. The wool of camels is used to produce many fine textiles including scarves, gloves and jackets, The Mongolian people use camel hair to make their homes, called yurts, as well as cine carpets. Rabbit hair can also be used for producing wool. Angora rabbits and their dwarf relative the Jersey Wooly are raised for their wool. Rabbits are combed out about every three months to retrieve their hair. Angora rabbits can produce about 3 pounds of hair per year. It is used to make sweaters, gloves and scarves. Jersey Woolies are a dwarf variety of angora rabbit with slightly shorter fur, making them somewhat easier to care for. Because of the delicate nature of angora wool it is sometimes combined with sheep's wool to make it more durable. The musk ox produces a soft inner wool called qiviut. The musk ox is found in far northern climates including Canada, Greenland and Alaska. The musk ox sheds its undercoat each spring by rubbing itself against anything it can find. People often collect it from wild animals by following the herd during shedding season. In captivity the wool is combed out in a thick blanket. An adult musk ox produces about 5 pounds of qiviut each year. Qiviut is warmer than sheep's wool and and as soft as cashmere. It is used to make scarves, hats gloves and other fine textiles. Why Is Yak Fiber Soft?